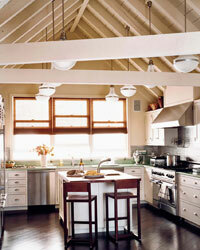 Steve Hanson adds some restaurant touches to the renovated kitchen in his country house. When Steve Hanson, owner of 15 restaurants, including Fiamma Osteria in Manhattan, and his wife, Deana, renovated the kitchen of their Hamptons beach retreat, they wanted to mix sophisticated restaurant style with a comfortable country aesthetic. Working with architect Stephen Brockman of the New York City firm Deborah Berke & Partners, they chose the "Square Guest" leather and black walnut stools from BDDW for their sleek architectural lines ($1,250; 212-625-1230 or bddw.com), which counterbalance the 1920s-style "Gare du Nord" Lambert lights. They ordered the pendants with an extralong, adjustable five-foot stem to accommodate the vaulted ceiling ($1,200; 877-494-1091 or pummer.com). The green countertops are made of durable glazed volcanic stone from the French company Pyrolave. "It has a lot of richness and a handcrafted sensibility, like pottery," says architect Brockman. The stone is available in more than 5,000 colors (from $290 per sq ft; pyrolave.fr). The Hansons ordered "Bristol" cabinets from Crown Point, including a 24-inch-deep upper unit (above), which is 10 inches deeper than usual to fit large serving pieces. That makes the cabinet flush with the appliances beneath them, for a clean look (800-999-4994 or crown-point.com). Many of Steve's restaurants have Jade ranges, so he chose the company's 48-inch residential version with six burners, a griddle and two ovens—one gas, the other electric ($6,200; 866-820-9401 or jadeappliances.com). The KWC "Systema" pot filler is mounted 16 inches above the stove, high enough to fit a lobster pot underneath ($785; 877-KWCFCTS or kwcamerica.com). A Miele espresso maker ($2,300) is stacked on top of a Miele convection steam oven, which Steve says brings out "pure flavor" in fish and vegetables ($2,200; 800-843- 7231 or miele.com). The Walker Zanger "Metallismo" stainless steel tiles combine the shape of a classic subway tile with the polished look of a restaurant kitchen (from $46 per sq ft; 818-252-4015 or walkerzanger.com). At home, Steve has a Sodir "Savoy," the same brand used at his restaurants ($1,040; 800-649-7885 or equipex.com). The KitchenAid mixer in metallic chrome complements the backsplash and restaurant-style equipment ($320; 800-541-6390 or kitchenaid.com). Miele "Incognito" dishwashers flank the main sink ($1,550 each; 800-843-7231 or miele.com). The island houses two double trash drawers directly across from the main sink.